Agricultural and Biological Sciences, Arts and Humanities, Biochemistry, Genetics and Molecular Biology, Business, Management and Accounting, Chemical Engineering, Chemistry, Computer Science, Decision Sciences, Dentistry, Earth and Planetary Sciences, Economics, Econometrics and Finance, Energy, Engineering, Environmental Science, Health Professions, Immunology and Microbiology, Materials Science, Mathematics, Medicine, Neuroscience, Nursing, Pharmacology, Toxicology and Pharmaceutics, Physics and Astronomy, Psychology, Social Sciences, Veterinary. 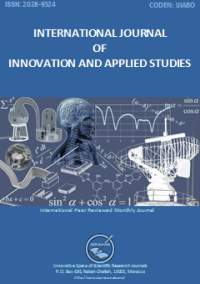 IJIAS hopes that Researchers, Graduate students, Developers, Professionals and others would make use of this journal publication for the development of innovation and scientific research. Contributions should not have been previously published nor be currently under consideration for publication elsewhere. All research articles, review articles, short communications and technical notes are pre-reviewed by the editor, and if appropriate, sent for blind peer review. Accepted papers are available freely with online full-text content upon receiving the final versions, and will be indexed at major academic databases.